EAST RUTHERFORD, New Jersey -- With the New York Giants facing a difficult decision on his coaching future after four straight years out of the playoffs, Tom Coughlin walked away gracefully, doing what was best for him. The Giants gave him 12 years to run one of the NFL's flagship organizations. He delivered two Super Bowls and restored the franchise to the league's elite for a while. It was mutually beneficial, and so was the departure Monday when the 69-year-old Coughlin resigned rather than force co-owners John Mara and Steve Tisch to fire him. The Giants announced the decision one day after the Giants (6-10) capped their third straight losing season with a 35-30 defeat against Philadelphia, their third in a row and sixth in seven games. "I met with (owners) John Mara and Steve Tisch this afternoon, and I informed them that it is in the best interest of the organization that I step down as head coach," Coughlin said in a statement. "I strongly believe the time is right for me and my family, and ... the Giants organization." RELATED: Current, former Giants players react to Tom Coughlin stepping down. The move may signal the end of a 20-year NFL head coaching career for Coughlin, one of 13 coaches to win multiple Super Bowls. It also may not. Coughlin loves to coach and if the right job popped up, who knows? "It is difficult to come up with words adequate to describe the appreciation we have for everything Tom Coughlin has done for our franchise," Mara said. "In addition to delivering two Super Bowl titles, Tom represented us with class and dignity, and restored the pride to our entire organization. He has all the qualities you could ever ask for in a head coach, and set very high standards for whoever will succeed him." Coughlin, Tisch, Mara and general manager Jerry Reese plan to hold a news conference Tuesday morning. The league's oldest active coach and third-longest tenured among the 32 who finished the season, Coughlin came into 2015 knowing he had to get the Giants back to the postseason to keep his job. It didn't happen because the Giants lost six games either in the final 1:14 of regulation or in overtime. "Obviously, the past three years have not been what any of us expect, and as head coach, I accept the responsibility for those seasons," he said. Where the Giants go from here is uncertain. They have traditionally hired from within or gotten someone with NFL coaching experience. A college coach would be a reach, especially a high-profile one who would want too much control. Offensive coordinator Ben McAdoo, who the Giants and Eli Manning like, might need more seasoning. Defensive coordinator Steve Spagnuolo's unit was last in the league rankings, although he had very little talent on the roster. Former Falcons coach Mike Smith might be an option, and there are a lot of coordinators around the league who are potential candidates: Bengals offensive coordinator Hue Jackson, Bears OC Adam Gase, Panthers DC Sean McDermott, and the Patriots' Josh McDaniels (offense) and Matt Patricia (defense). Coughlin's future was the main topic as players cleaned out their lockers Monday. The coach had spoken to the team earlier in the morning and many were saddened by the thought he might not be back. "It has been one of the greatest honors of my life and career to be led by Tom Coughlin; my life will forever be changed," placekicker Josh Brown tweeted after the resignation. This might have been one of Coughlin's best years as a coach. He didn't have a strong roster, and his defense spent the first two months with end Jason Pierre-Paul sidelined by a July 4 fireworks mishap that mangled his right hand. Coughlin posted a 110-93 record in 12 seasons with the Giants, winning three division titles in addition to his two league crowns. He was 72-64 in eight seasons with the then-expansion Jacksonville Jaguars, winning two division titles and taking them to two conference championship games in their first five seasons. Ernie Accorsi and Mara hired Coughlin in 2004 after Jim Fassel was fired. "Tom Coughlin is a great coach and an even better man," Accorsi said. "He has left his mark on this great franchise, and his legacy of excellence is secure." 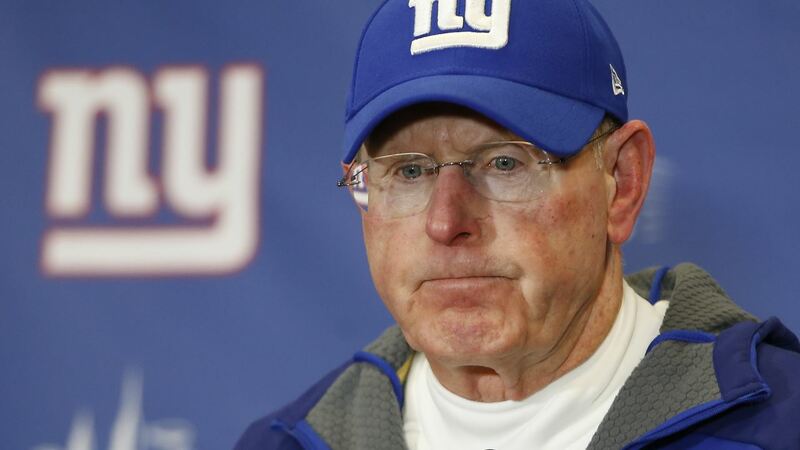 A no-nonsense coach, Coughlin vowed to restore Giants pride and it didn't take long. They won the division the following season and shocked the football world by knocking off the then-undefeated Patriots in the Super Bowl in February 2008. The second came after the 2011 season, also against the Patriots.